Spend Christmas in Savannah this year, with your family. As the holidays approach, many of us are struggling to figure out where we’ll be and when we’ll be there. Will we travel to see family, or will they travel to see us? Will we board a plane, or spend a long day or two in a car. Decisions, decisions, decisions. Why not try something completely different this year? Meet in the middle. Gather your family together at a Savannah Vacation Rental. 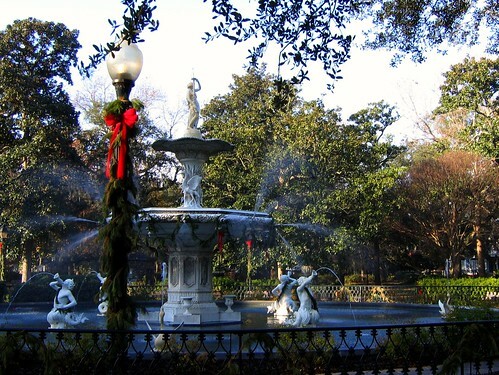 Savannah is a beautiful city any time of year, but especially during the holidays. It’s also centrally located on the Eastern Seaboard. If you have family in Florida, North or South Carolina, Virginia, or Atlanta, you can all drive a few hours and meet in Savannah. Our Savannah Vacation Home at 109 West is large enough to comfortably lodge 26 people. Imagine how this many house people would feel in your home, or the home of your parents or children. It’s better to be on neutral territory, where no one has to feel single-handedly responsible for cooking and cleaning. You’ll all have more fun if you spend the holidays together in Savannah. It’s a bold idea, but it is certainly worth consideration.